Windy with showers early, then cloudy overnight. Thunder possible. Low 38F. Winds NNW at 20 to 30 mph. Chance of rain 60%..
Windy with showers early, then cloudy overnight. Thunder possible. Low 38F. Winds NNW at 20 to 30 mph. Chance of rain 60%. Mass of Christian Burial will be 11 a.m. Saturday, April 13, 2019 at Saint Elizabeth Ann Seton Catholic Church in Keller, Texas. 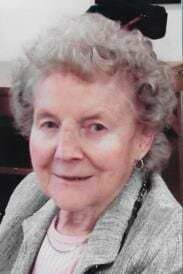 Visitation will begin at 10 a.m. Interment: Calvary Cemetery, Sheboygan, Wisconsin on Saturday, June 15, 2019 at 11 a.m.
Catherine Mary Marr, 92, passed away Wednesday, February 20, 2019, in Fort Worth, Texas, after a long battle fighting Parkinson's disease. Catherine was born in Douglas Township, Iowa on August 14, 1926. She married Francis Marr on December 27, 1947 and together they raised seven children in Sheboygan, Wisconsin. They owned and operated the “Witt's End Motel” for several years. After her husband, Francis, passed away, Catherine worked as a secretary in the office of Urban Middle School in Sheboygan. She loved to travel and spend time with her family as much as possible. With her family, she took several cross country trips to the east and west coasts. She had a sense of humor and a strong will. Photo albums were her specialty and she was meticulous in compiling family pictures. She never wasted anything. Known as “Kay” to family and friends, she will be greatly missed and always remembered for her patience, reliability, compassion, love of family, and zest for life. Catherine was preceded in death by her first husband, Francis Marr, her second husband, George Conrardy and her beloved daughter, Ann Jenine. She is survived by her daughter, Debra Vopal and husband, Michael (only and ‘favorite' son-in-law); sons, David and wife, Doreen, Kenneth and wife, Evelyn, Philip and wife, Kathleen, Patrick, Timothy and wife, Kathleen; grandchildren, Allison (Brian), Michael, Terra, Scott (Susan), Jennifer (Michael), Brian (Lori), Christine (Travis), Amanda (Joseph), Samantha (Jacob), Cornelius (Melanie), Emerson (Stephany), Kyle, Kari, Angela (John Patrick), Katherine, Elizabeth and Caroline; great grandchildren, Karlye, Khloe, Silas, Penelope, Colin, Samuel, Megan, Melissa, Baxter, Joseph, Talia, Tatum, Rohan, Lorelai, LaReyna, and John Patrick.